Garmin, the company known for GPS devices that help drivers navigate and runners record their mileage, released a new product for dog owners last week. The Delta Smart, a small, smartphone-compatible contraption that slips onto a collar, can help keep pooches fit by tracking the time they spend active or sedentary. 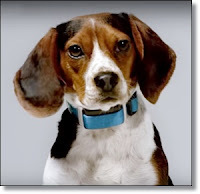 But the product’s primary selling point, according to Garmin, is its ability to “reduce or eliminate unwanted behaviors” and make your dog a “more enjoyable member of the family.” How? By either beeping, vibrating or issuing “static” at one of 10 levels when a dog does something its owners don’t want it to do, including barking. In other words, it can function as what’s more commonly known as a shock collar, and it can work remotely. “Dogs aren’t born with manners,” Garmin declared in a video posted Thursday to its Facebook page. In it, the company calls out some familiar canine offenders that the product purports to help: the blinds shredder, the trash can tipper and the moccasin dismantler, among others. The video was clever, and it featured very cute canines. But many dog lovers were not amused. As of Tuesday afternoon, the video had nearly 2,800 comments, the most popular of which collectively amounted to a flood of condemnation. “Great idea, Garmin! Let’s electrocute the kids while we’re at it, too!” wrote Jill Botti. “Save some money on a babysitter and raising them ourselves, ain’t nobody got time for that, amirite? ?” That got nearly 300 likes. It’s not the first time passions have flared over these kinds of gadgets, which are also known as e-collars. The devices are banned in some European nations, and countries including Canada and Scotland have considered prohibitions. They’re opposed by some researchers, the American Veterinary Society of Animal Behavior and other national organizations, and by many trainers, who dismiss them as unhelpfully punitive and stressful for dogs. “An issue with punishment as a training method, which includes shock collars, pinch collars, choke collars and even verbal reprimands, is that you aren’t really telling the dogs what to do,” said John Ciribassi, AVSAB president, told the Post earlier this year. But they also have vociferous backers, who say that they’re humane and effective when used correctly. James Hamm, who bills himself as the “Lone Star Dog Trainer,”he helped tested the Delta Smart. Yes, that’s right: Garmin makes training collars, plural. As some who stood up for the company on Facebook pointed out, the Delta Smart isn’t the first dog behavior device released by the company, which also makes products called Bark Limiters. It’s just the first to stir up such a storm. Why Do So Many Veterinarians Commit Suicide?